Welcome to Mag Challenge #34, this week we are introducing our New Design Team, make sure you stop by MAG and check all the wonderful designers who have decided to take the plung, these ladies can ROCK a challenge!! Now on to the project for this week, we are to use Simply Charmed page #39, remember we can only use the images on this page everything else has to be embellishments. 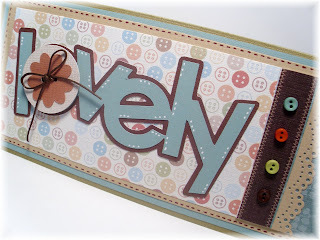 I decided to go with the word "lovely" it's on a 4x9 card base and is cut at 2.43. The patterned paper is from The crafty stack and all other papers are from my scrap bin. Think it turned out nicely! Now it's time for you to hurry to your craft rooms and get those creative juices flowing, link your project to Mag Challenge, make sure you invite a friend to join in on the fun! You rocked this one. Simply perfect!! I love this card Melissa! It is so cute. Okay Melissa this is truly lovely. Melissa I love how you have a sewing theme with the buttons and the stitching. I love it. The colors are so beautiful. This is so cute, I love the button paper!!! Adorable! I love the button paper and the button embellishments. 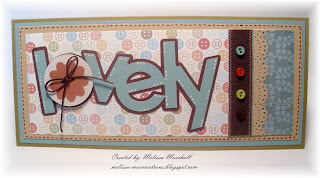 Very LOVELY nice job M- I have something for you over at my blog.